This is a 7 x 5 apex shed, and there are plenty of things in the shed that make it a worthwhile addition to your garden. But with practicalities first, you’ll be impressed by the fact that the shed has styrene glazing included in it. 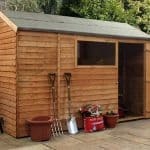 This glazing is shatterproof, which makes it perfect for anyone who has children nearby, and also a safer shed overall will result from having this particular feature in it. 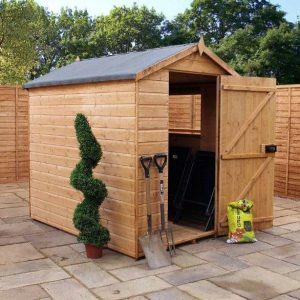 Your shed will bring you plenty of durability as well. For example, there is tongue and groove cladding throughout the building. This actively stops rain water from entering, which leads you to a guarantee that the manufacturer supplies, covering you for 10 years against rot. 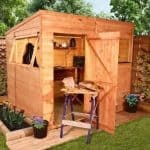 This may be a small shed, but it offers a surprising amount of interior space. This is largely thanks to the Apex roof. Providing a traditional style, the Apex roof increases the sheds height and also ensures rain water drains quickly and easily. We really like the way it has been put together too. Just by looking at it you wouldn’t guess it comes at such an affordable price. The 7×5 benefit from a lot of great features. The main ones can be found below. 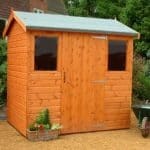 10 year anti-rot guarantee – To highlight its high quality design, the shed comes with a great 10 year anti-rot guarantee. Free mineral roofing felt – The free sand roofing felt provides great weather protecting, helping to increase its durability. Floor joists – The floor joists help to keep the shed floor away from the damp ground. This again improves durability and prevents further damage from rot. Not only that, but the joists provide extra support for the base, helping to give a sturdier build. Double, round edged framing – The framing on the inside of the shed has been planed and rounded to prevent splinters. The double framed corners also add great stability to the overall structure. Shatterproof Styrene glazing – One of the safety features of the shed are the great shatterproof styrene windows. One of the best glass alternatives, the material is difficult to break and the window allows adequate light into the shed. Choice of window placement – One feature which many customers are happy with is the choice of window placement. This gives you the freedom to install the shed on either side of the garden. Choose to have the windows on either the right or the left hand side. 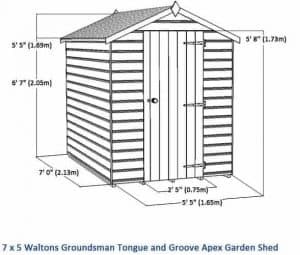 12mm tongue and groove cladding – Interlocking 12mm tongue and groove cladding helps to maximise the sheds strength and also provides great weather protection. The 7×5 is one of the safest models available on the market. It benefits from plenty of durability and stability enhancing features. The styrene glazed windows are particularly great for those with young children. The shatterproof design gives you complete peace of mind. 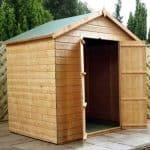 Despite being a value shed, nothing has been compromised in terms of quality and safety. It even comes with a rim lock to ensure maximum security. You would think because this is a fairly small shed, it would be somewhat easy to put together. Don’t let the small size fool you. While the instructions may be simple and easy to follow, the installation is fairly heavy work. So it is advised that 2 people work to put it together. However, the one thing we do like is that the boards fit perfectly together. 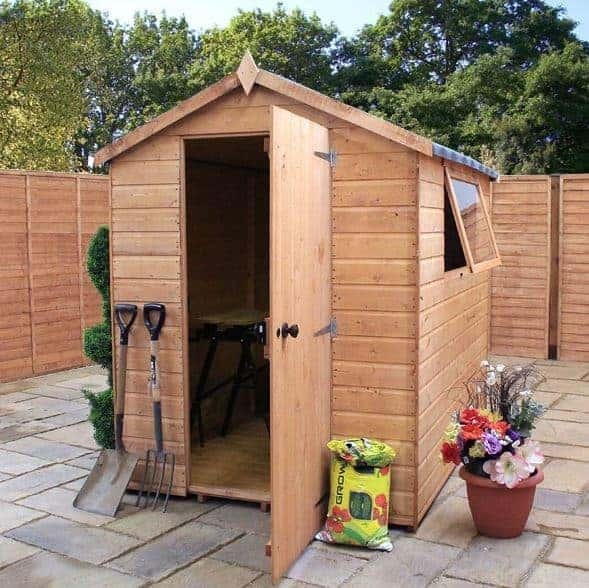 Safety is by far one of the biggest advantages of this small shed. 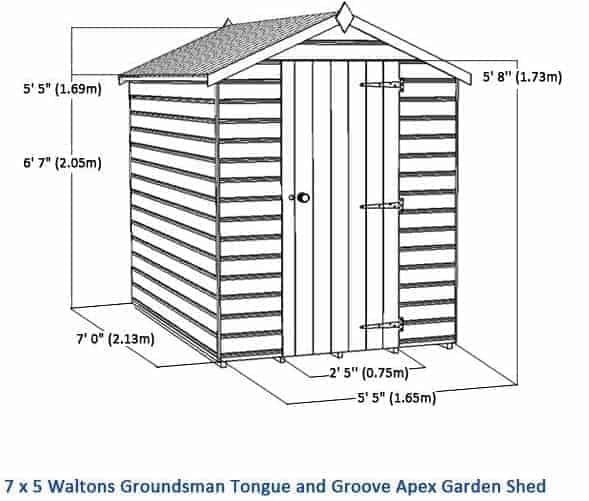 It is one of the most secure, safe and durable sheds available in the Waltons collection. We were really impressed by the quality of the shed and its excellent range of features. In terms of cons, it isn’t painted so while this isn’t a major concern for us, it is something that you might be disappointed with. The 10 year anti-rot guarantee is also a little misleading. 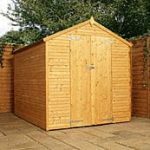 It isn’t made overly clear by the manufacturer that in order to benefit from the guarantee you will need to add your own high quality preservative to the shed once you have built it. 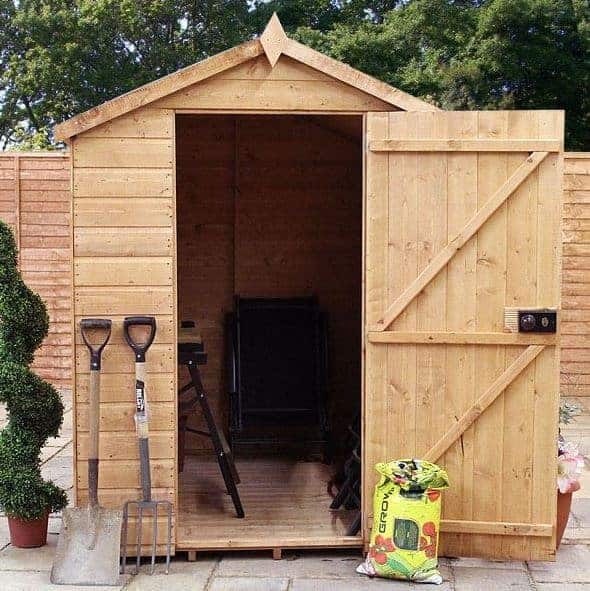 This is one of our favourite sheds because it not only comes in a small enough package to fit most gardens, but it also designed with extra durability in mind. The apex roof gives it a quaint, traditional style and the amount of interior space you are provided with is brilliant. 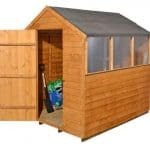 It would make a great first shed or would suit those who have minimum outdoor storage requirements.